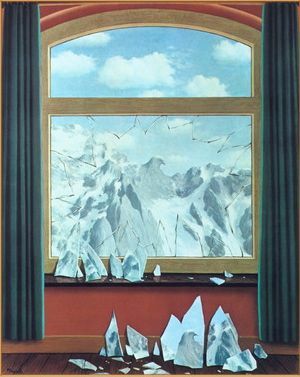 by French painter René Magritte (1898–1967). There is something endlessly puzzling about his imagery. Is the narrator describing something beautiful or horrific? Is this seemingly one-way trip down a river an excursion into Paradise or into Hell? Is the narrator mad, delusional or hopelessly imprisoned in Ellison’s odd vision? Is Ellison’s vision of Heaven more terrible than what we might presume to be a vision of Hell? Notes: The epigraph by Giles Fletcher is from the second canto of Christ's Victorie and Triumph, in Heaven, in Earth, over and after Death (1610). A.R.J. Turgot, Richard Price, and Joseph Priestley were philosophers identified by philosopher Nicolas de Condorcet as proponents of the doctrine of the perfectibility of human beings. Claude (p. 859) refers to landscape painter Claude Lorrain (1600–1682). Joseph Addison (p. 862) is the author of the play Cato (1712), a tragedy based on the life of Cato the Younger, a contemporary of Julius Caesar. Timon (p. 864) lived in ancient Athens and was famous for his misanthropy. Madame de Stael (1766–1817) was a French writer most famous for her novel Corinne. Fonthill (p. 865) is a reference to Fonthill Abbey, the grand architectural project of William Thomas Beckford, who inherited one million pounds in 1771 at the age of ten. From his cradle to his grave a gale of prosperity bore my friend Ellison along. Nor do I use the word prosperity in its mere worldly sense. I mean it as synonymous with happiness. . . . If you don't see the full story below, click here (PDF) or click here (Google Docs) to read it—free! I have loved reading Poe since 'discovering' him in high school. I look at wood floors and think of "The Tell Tale Heart". I have been focused on purchasing the works of William James...time to move on to Poe!